There is often a critical gap between knowing what could be helpful and then making that information known so that it can be put into practice. Filling that gap is the specialty of an organization called Modernizing Extension and Advisory Services (MEAS; www.meas-extension.org/). MEAS has produced a wealth of informational materials focused on best strategies, tools and resources for strengthening the role that rural extension systems play in increasing food production and farm income. Their publications are relevant to those looking for the best ways to transfer knowledge and skills to farmers coping with various challenges. 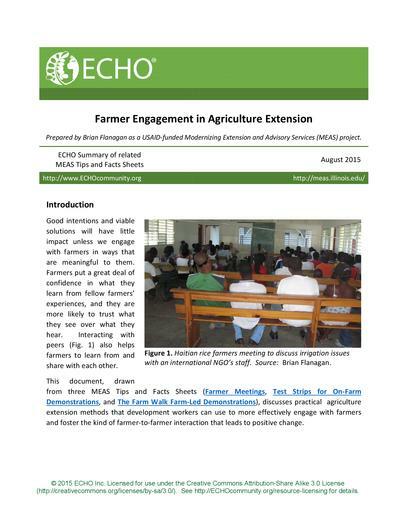 With generous support from MEAS, ECHO completed a project to extract, summarize and disseminate key MEAS insights and lessons to our growing network of field-based practitioners. This resulted in twelve summaries of MEAS materials shown on this web page. Technical Note 83, also completed with support from MEAS, captures key lessons and practices from community human/animal health programs that apply to agriculture extension efforts. 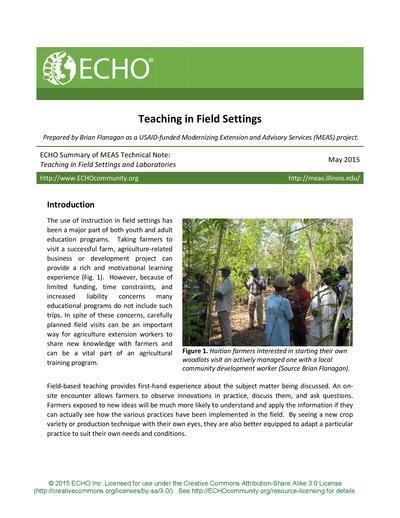 It is especially relevant to those looking for insights on how to utilize community-based extension workers to reach farmers in areas where it is not practical to bring in outside personnel to teach and conduct extension activities. For those who wish to study a particular topic in greater depth, references and suggestions are provided for further reading. We trust that these documents will help you be more effective in communicating hunger-related options among the farmers you serve. The complexity of the global food system creates a diverse group of actors ranging from smallholders to large corporations involved in the agriculture sector. Each of the many actors in an agriculture value chain has different needs, objectives, strengths and weaknesses. With women accounting for 43% of the agriculture workforce in developing countries, there is a need to ensure their ability to access and participate in agricultural markets. Gaining a deeper understanding of value chains, with special attention to gender roles, is an important step in reducing poverty and improving livelihoods for both women and men. 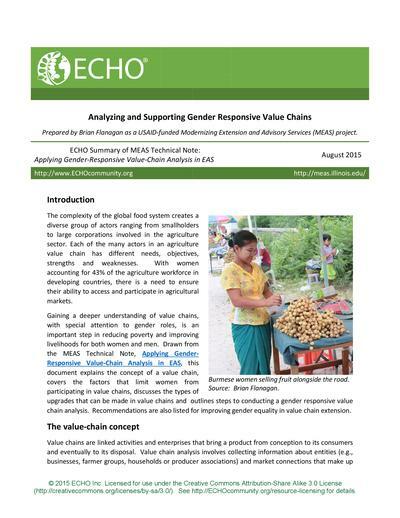 Drawn from the MEAS Technical Note, Applying Gender-Responsive Value-Chain Analysis in EAS, this document explains the concept of a value chain, covers the factors that limit women from participating in value chains, discusses the types of upgrades that can be made in value chains and outlines steps to conducting a gender responsive value chain analysis. Recommendations are also listed for improving gender equality in value chain extension. 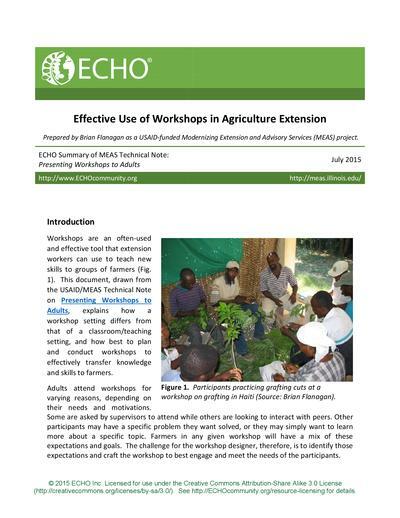 Workshops are an often-used and effective tool that extension workers can use to teach new skills to groups of farmers. 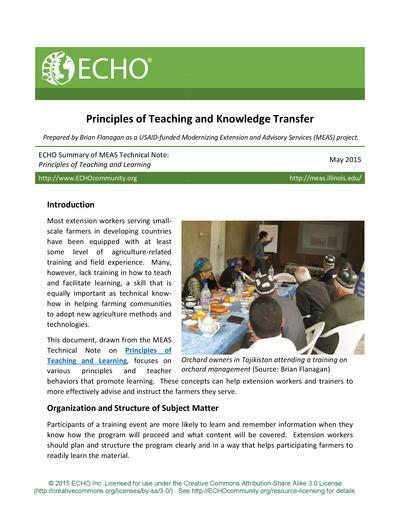 This document, drawn from the USAID/MEAS Technical Note on Presenting Workshops to Adults, explains how a workshop setting differs from that of a classroom/teaching setting, and how best to plan and conduct workshops to effectively transfer knowledge and skills to farmers. 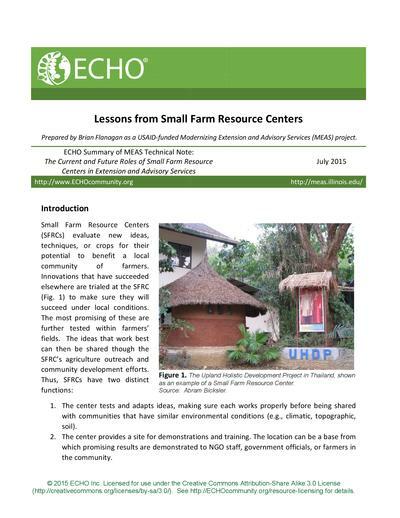 Based on a MEAS paper entitled, The Current and Future Roles of Small Farm Resource Centers in Extension and Advisory Services: Synthesis Report from Seven Case Studies in Southeast Asia, this document highlights key take-a-ways of an assessment by ECHO of seven SFRCs in Southeast Asia. Through questionnaires, surveys, site visits and various other means, data were collected from December 2012 to March 2013 in order to “illustrate and classify the concept of the SFRC, evaluate their outreach efficacy, and provide recommendations to amplify their extension services.” In summarizing key findings of this assessment, this paper reviews the models of extension and advisory services used at SFRCs, the main challenges and limitations of SFRCs, and key lessons learned to help in starting and running an effective SFRC. Field-based teaching provides first-hand experience about the subject matter being discussed. An on-site encounter allows farmers to observe innovations in practice, discuss them, and ask questions. Farmers exposed to new ideas will be much more likely to understand and apply the information if they can actually see how the various practices have been implemented in the field. By seeing a new crop variety or production technique with their own eyes, they are also better equipped to adapt a particular practice to suit their own needs and conditions. Instruction during a field visit should be based around defined educational objectives. The experience should be designed to help participants make connections between the field-based instruction event and concepts they are learning through more classroom-oriented instruction. Science education research has shown that well-planned field experiences significantly increase the level of factual knowledge and conceptual understanding gained by participants. This document addresses three stages of creating successful instruction in field settings. It is drawn from the MEAS Technical Note on Teaching in Field Settings and Laboratories. The lecture is one of the oldest and most widely used methods of teaching. 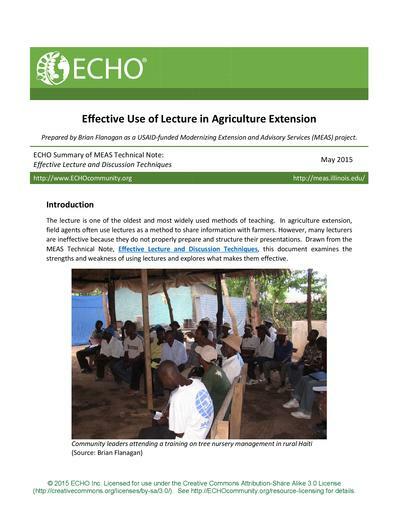 In agriculture extension, field agents often use lectures as a method to share information with farmers. However, many lecturers are ineffective because they do not properly prepare and structure their presentations. Drawn from the MEAS Technical Note, Effective Lecture and Discussion Techniques, this document examines the strengths and weakness of using lectures and explores what makes them effective. Most extension workers serving small-scale farmers in developing countries have been equipped with at least some level of agriculture-related training and field experience. Many, however, lack training in how to teach and facilitate learning, a skill that is equally important as technical know-how in helping farming communities to adopt new agriculture methods and technologies. This document, drawn from the MEAS Technical Note on Principles of Teaching and Learning, focuses on various principles and teacher behaviors that promote learning. These concepts can help extension workers and trainers to more effectively advise and instruct the farmers they serve. A participatory learning approach, applied at each stage of a community development project, is crucial to reaching the level of stakeholder involvement needed for lasting, positive change. The use of participatory survey and planning methods in the development process encourages community ownership of projects, allows for information to flow between both the community and the development organization, and enhances accountability between the organization and the community. 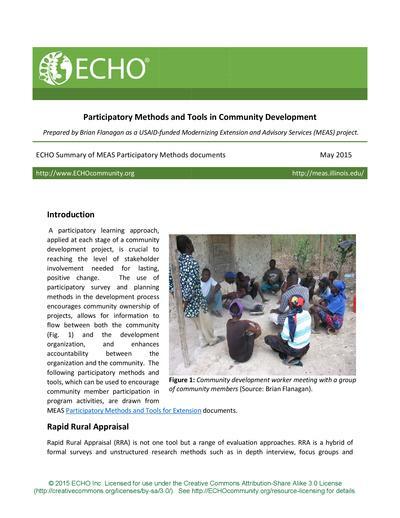 The following participatory methods and tools, which can be used to encourage community member participation in program activities, are drawn from MEAS Participatory Methods and Tools for Extension documents. As extension programs must increasingly accomplish more with less, information and communication technology (ICT) can be utilized to ensure that vital information continues to reach rural agriculture communities in developing countries. 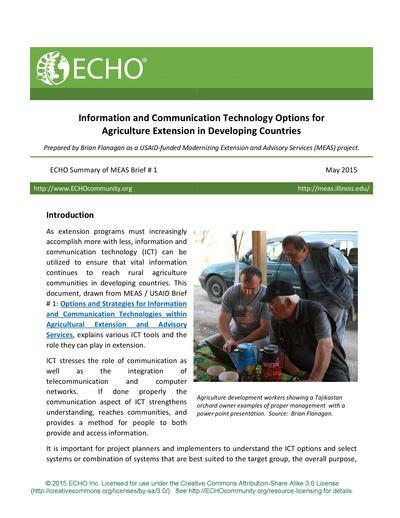 This document, drawn from MEAS / USAID Brief # 1: Options and Strategies for Information and Communication Technologies within Agricultural Extension and Advisory Services, explains various ICT tools and the role they can play in extension. This article draws from the MEAS Brief # 2 Reducing the Gender Gap in Agricultural Extension and Advisory Services: How to Find the Best Fit for Men and Women Farmers. 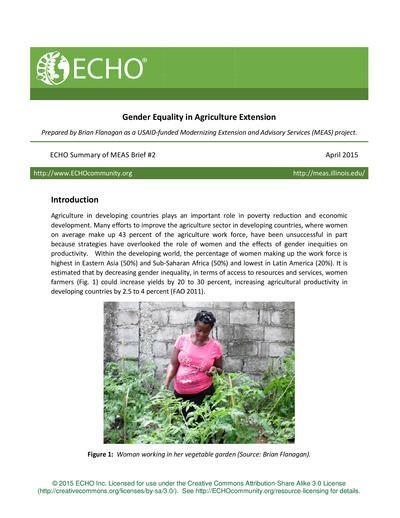 Many of the gender-related topics and lessons discussed in the MEAS Brief also apply to the transfer of knowledge and resources that agriculture development workers provide in their projects. This paper will discuss the case for gender equality in agriculture extension, and look at several gender-related barriers and how they can be overcome.